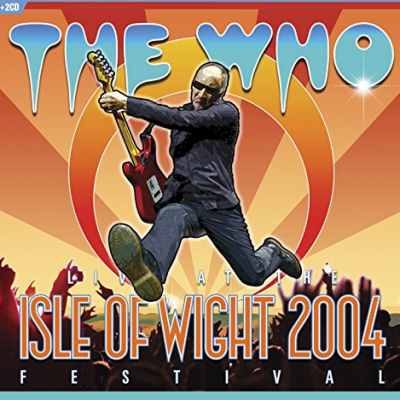 DVD/CD Review: The Who, "Isle of Wight 2004 Festival"
Only two years after the long-dormant festival was resurrected, one of the bands who left a pretty timeless mark previously at the storied festival, returned to play another blistering set, this time, highlighting their own incredible career. The Who returned to the U.K. stage for the first time since the death of bass player John “The Ox” Entwistle and took the Isle Of Wight Festival by storm for the first time since 1970. As expected, their set was a deadly force of power, pop, rock, drama, theatre and downright unstoppable beauty (which 9 times out of ten, you can pretty much expect from a Who performance). Aided and abetted by the stellar talents of Pete Townshend’s brother, Simon, on second guitar and vocals, session bassist/virtuoso talent Pino Palladino (the only man who could step in for the late and sorely missed Entwistle), thunder drummer Zak Starkey (taught to play by Keith Moon, so it’s only natural) and long time Who keyboardist Rabbit Bundrick (who has since left the band), this line-up constitutes the perfect balance of fleshing out The Who’s highly intricate sound without watering it down or making it less than dynamic. The hits and concert staples are here, along with a few surprises and it’s a very healthy mix, spanning the band’s decades of being road (and studio) warriors. Opening with the now-traditional “I Can’t Explain”, they tear into “Substitute” and on to “Anyway, Anyhow, Anywhere” (which you wouldn’t normally expect – at least, not at that time) – a joy to see and hear them bring back into the fold, as it’s such an often-overlooked track. High points from Quadrophenia include the triad of “The Punk Meets The Godfather”, “5:15” and “Love Reign O’er Me” (once again reminding you why Roger Daltrey is the greatest rock singer of all time). A spirited run-through of “You Better You Bet” leads into the all-time anthem, “My Generation” and the Tommy section doesn’t disappoint with the thread of “Pinball Wizard”, “Amazing Journey”, “Sparks” and “See Me, Feel Me”/”Listening To You”. If you’ve never experienced (and that’s the key word: experience) seeing The Who live, it is absolutely essential that you do while there’s still time. Even now – thirteen years after this show was filmed – they’re still out there, doing it. Some nights may be better than others, but regardless, you will never be disappointed by them for the sheer energy and life they breathe into these songs and into their audiences. I know – I’ve seen them many times over the years. And this visual documentary is a perfect reminder of what Pete Townshend, Roger Daltrey and those songs can do for the human spirit.